I received this beer as a birthday present in 2013 and it sat in my fridge for several months mocking me, goading me. 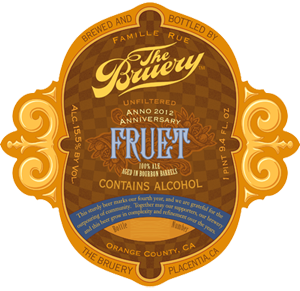 After taking a recent trip to Orange County and trying several of the Bruery’s sour efforts I felt like the time had come to crack this beer open. 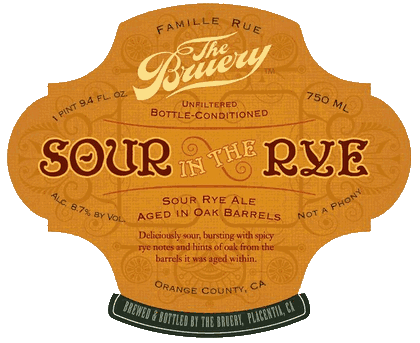 SOUR IN THE RYE (2013) is an 8.7% ABV American Wild Ale aged in oak barrels. Over the past few months I’ve really been on a Bruery kick. It started with first real trip to their tasting room in Placentia, California (I had been there once before to pick up a bottle of Black Tuesday, but I didn’t get to drink anything that time). Then it was a bottle of Hottenroth on a brew day and my roommate sharing with me a glass of his Rueze. And now here we are. I bought this bottle back in 2012 when it first came out and I’ve been sitting on it ever since. I was waiting for the right time to open it and, as they say, there’s no better time than the present…however if that was true then I wouldn’t have sat on it for a year and a half, but I digress.